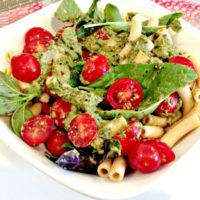 I love pesto! I grow Thai basil from seed and purchase large leaf Italian basil plants from Trader Joes. They both grow abundantly and provide me with basil throughout late spring, summer and early fall. As it gets hotter and they grow taller, I can’t use the woody stems and only use the leaves. So adding peas helps boost volume, fiber and cuts down on the cost of meal per serving since pesto ingredients are expensive. Recently I’ve been into bean pastas. 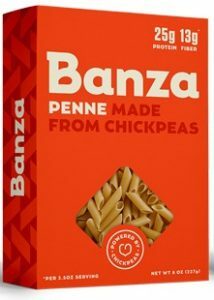 Banza (eatbanza.com) shipped me some samples and I LOVE it! The texture is delicious –just be sure NOT to over cook it. In just 2 oz it provides 14 grams of protein and 8 grams of fiber. Because I count grams of protein per meal/day I’m always searching for new foods to help meet my nutrition needs for exercise and weight lifting. This pasta is gluten free and so is this tasty pesto. Heat frozen peas in microwave until soft. 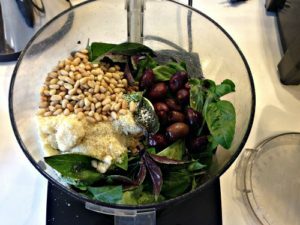 Measure and place all ingredients in food processor. Blend until smooth consistency. Wash and half cherry tomatoes. Cook pasta – stir often and check consistency at 7 and 8 minutes. Do not cook past 9 minutes, serve al dente. 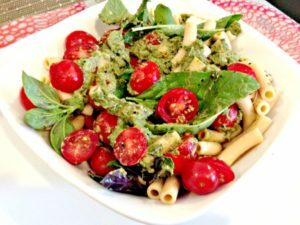 Mix pasta with pesto and top with chopped tomatoes. I also sprinkle in some additional pine nuts, drizzle with balsamic vinegar and add fresh basil leaves. « Look 5 Pounds Lighter Instantly!